There is nothing that symbolizes the devotion the Showmen’s League has to its members and to showpeople in general than Showmen’s Rest. 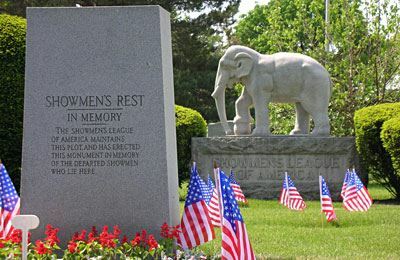 Set in Woodlawn Cemetery, surrounded by five elephants, trunks lowered in mourning, it remains the final resting place for many of our brothers. The idea of having a place of rest for showpeople had been discussed at various times during the early history of the League, but nothing had been done about it. In 1916, Brother Lew Nichols took it upon himself to make what had started out as an idea a reality. Brother Nichols spent most of that fall gathering estimates and reported his findings at a special meeting on March 9th of 1917. At that meeting Brother Walter Driver made a motion, and it was carried, for $1500 Woodlawn Cemetery would house Showmen’s Rest. The first Chairman of the Cemetery Committee was Lew Nicholas who owned a monument company and offered to provide tow stone settees, two corner benches and two corner posts at the cemetery lot at no cost to the League. The purchase of the cemetery plot proved to be extremely timely for the League. The following year, 1918, saw one of the greatest tragedies that has ever befallen the outdoor amusement industry. On June 22, 1918, the time at about 4:00 am Dawn was not yet painting the eastern sky. The Hagenback-Wallace Circus was scheduled to present its fabulous spectacle in the Show Grounds at 150th and Calumet Avenue in Hammond, Ind. Advance ads had prepared the town of Hammond about the chills and thrills that awaited them under the Big Top. As usual there would be clowns, lions, elephants and tight-rope walkers for the crowds to see. The local town folk had been visited by this circus in 1907, 1910, 1912, and 1914. This Circus was one of the premier circuses of its day. This show was carried on three special trains, the show had over 22 tents and 1,000 + employees on its weekly payroll. Even in those days costs amounted to approx. 7,500 per day. In Hammond, at 10:00 am the children of the town were out to get ready for the big arrival of the much anticipated circus. There was no parade, no clowns, but only a memory that lives with us forever. Earlier at about 4:00 am while the train was heading toward Hammond, Indiana, carrying 400 performers and roustabouts, the train had to make a stop near Ivanhoe in order to cool an overheated wheel bearing box. The Brakeman alerted the conductor with a signal flare thus signaling the engineer to bring the train to an immediate stop. The front segment of the 26-car train now rested on the Gary & Western Railroad tracks, heading west into Hammond. The rear of the train sat on the Michigan City Railroad tracks on which section 2 had traveled from Michigan City, Ind. during the night. The middle cars rested on the crossover spur. Red lights were turned on to warn any other approaching trains that a train had stopped on the tracks. An empty troop train was approaching at full speed from behind, piloted by engineer Alonzo Sargent, who had previously been fired for sleeping on the job. Ignoring the red lights, at Signal No. 2581 and the efforts of a frantic flagman to signal the oncoming train, it plowed into the back of the circus train, destroying three sleeping cars before finally coming to a halt. A fire then broke out. Survivors of the crash, trapped under the wreckage, were unable to free themselves and escape the flames. An estimated 86 people died in the accident. No animals were killed. Most of the dead were roustabouts who had been hired hours or days earlier for the Hagenback-Wallace performance in Michigan City. Among Circus performers were often known only by nicknames, and many had joined only recently. The stones shown here are labeled "Baldy" and "4 Horse Driver"; almost all of the others simply read "Unknown Male", followed by a number. Among the dead were Arthur Dierckx and Max Nietzborn of the "Great Dierckx Brothers" strong man act and Jennie Ward Todd of "The Flying Wards". Hagenback-Wallace Circus only missed a single performance, the one in Hammond. By the next day they had borrowed enough acts from other circuses to be able to put on the scheduled show in Beloit, Wisconsin. As the news of the accident spread, The Showmen's League of America acted, the League's officers at once moved to provide a last resting place for the crash victims. Five days after the crash, the survivors gathered at Woodlawn Cemetery for the burial of 56 of their fellows. 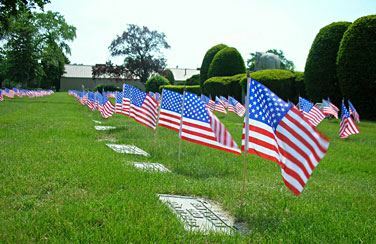 The Showmen’s League of America still gathers at Woodlawn Cemetery on Memorial Day, when we remember our loved ones and all of our brothers that are buried in our small plot, our symbol of devotion to our industry.